Rockstar Games has their Grand Theft Auto: Chinatown Wars van making the rounds to promote the upcoming Nintendo DS game, and while we would never encourage stealing, isn't it just begging for it? 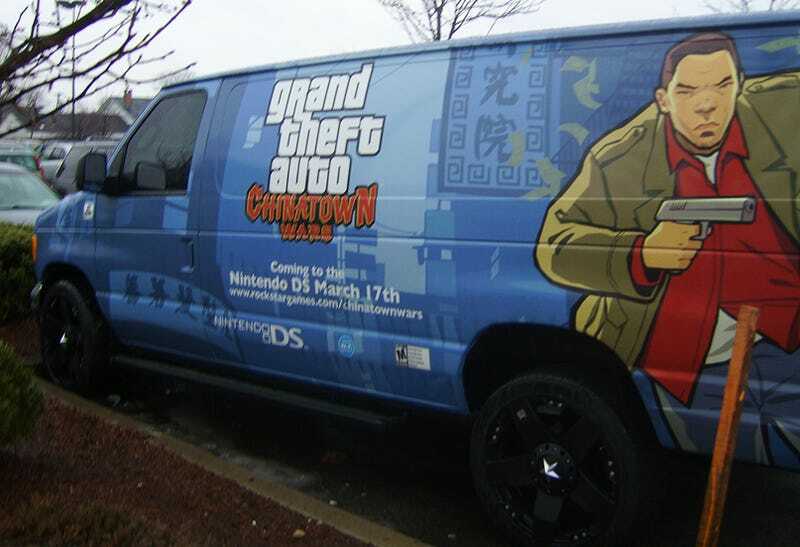 I can't help but smile imagining the Rockstar representatives, on their way out of the Massachusetts GameStop where they were demoing the upcoming game, walking up to an empty parking space where their lovely Grand Theft Auto: Chinatown Wars van was parked. I imagine they'd just stare at the space for several minutes before turning to each other and having a good laugh over the irony of the whole situation. Then maybe Kotaku reader Farnic, who sent in these shots, could let them crash at his place for the night. Once again, we would never condone stealing anything, if you were dead set on making away with a vehicle, this would be the one to make away with.